Isn’t that sweet? The patient is showing his gratitude for all of the great care that he received while staying at the hospital. 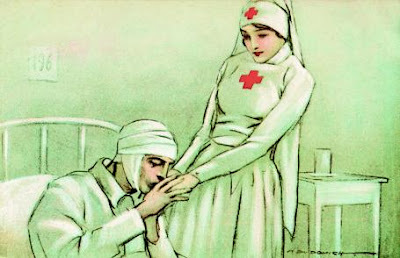 In fact, I think that he has fallen head-over-heels in love with his pretty nurse. It’s not surprising. Nurses care about people, and we are patient advocates. When I was a medical-surgical nurse, I remember finding oodles of candy boxes and bouquets of flowers everyday at the nurses station. People showered the nurses on my unit with gifts as their way of saying thank you. Things really changed when I became a psychiatric nurse. It’s rare when psychiatric patients give candy and flowers to nurses. I’m not saying that we never get goodies from our patients, but psychiatric patients have unique reasons for not giving goodies to their nurses. Paranoid patients are not going to give gifts to nurses who can read their mind and who are trying to kill them with medications. We understand that, and we accept the logic of the situation. We also accept that we aren’t going to get candy and flowers from patients who display inappropriate behavior on the unit. Psychiatric nurses have no problem laying down the law when someone is being a jerk. This makes us unpopular with drug seekers and individuals who are using the hospital as a hideout from the police. And then there is the issue of money. Most of our patients are broke. Many of our patients can’t afford food or decent housing, so we certainly don’t want them spending their money on us. The nicest gifts that psychiatric nurses receive are homemade thank you cards. Our patients make them for us in art therapy, or when they are watching TV in the dayroom. We really enjoy these mementos. We hang the cards up in the nurses lounge, and in our report room. We keep them up on the walls long after our patients are discharged because they keep us going when we are ready to throw in the towel and quit nursing. Thank you everyone, and please keep those cards and letters coming. It takes a special kind of person to be a psych nurse. Thank goodness there are those who are willing to do it despite the crappy hours, crappy pay, and nutty people they have to deal with (and I'm not even talking about the patients). I once had a psych patient tell me when he was discharged, he was going to come back, and bring me some chocolate milk. I'm still waiting, 4 years later. . .
Of course, one must be wary of the homemade goodies that will on occasion show up. Maybe it is I who is paranoid. I'd settle for a good Press Ganey. 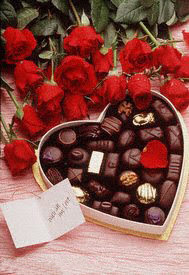 i will take a card or a written thank you note over a box of chocolates. any day. I liked my short Psych rotation. The patients expected nothing of you except to be an ear to listen. I can imagine all that anguish becoming hard after awhile. I would cherish those cards and letters too. I think the patient would be charged with sexual harassment now! Your job as a psych nurse is really special and very demanding.I would land up in the ward myself if i had to do it.And thank you on behalf of everyone who is not in the ward. When I was in high school I decided to become a nurse and not just any nurse but a psch. nurse. I wanted to work in one of the state run hospitals for the mentally ill. Why? Because the pay was good and it just seemed like something I could do. Once I got to nursing school and did my psch. rotation I had a different idea of it though. I had to spend an entire summer on the campus of the state hospital because the little town I come from didn't have a psch floor in the hospital. I found out the hard way how difficult it is to be the nurse for crazy people. I remember the infirmary nurse having to deal with a pt. who had an abd. wound from a surgical procedure and the pt would pull the dressings off and get out of bed and take a crap on the bedside table! It is hard enough to care for some people but a sick crazy person is too much! I think you are great for doing what you do and every time I encounter a pscho pt in the home care setting I wish I had your number! That picture illicits comments for me with regards to how nurses are viewed. I just did a whole paper on nursing history and our uniform...in doing my research I read a lot about nursing history as a whole and how nurses were percieved....I don't know what it is....but I didn't go into to nursing to be someone's angel of mercy as nursing is known for....the connotation of "angel of mercy" just doesn't sit well with me...it makes me think that we are nothing more than being someone who can hold a patients hand.....now don't get me wrong...in some cases the simplest gestures make the most impact...but I love nursing for the medical side of nursing...for the opportunities it has given me..the great satisfaction I get when I see a patient make positive movements towards health, and health promotion. I enjoy health education and cardiac care.